Do you want to get a leading edge on the top outdoor advertising in Vallejo? If so, the professionals at Veale Outdoor Advertising can help you secure one of the best billboards on I 80. Each day, your message can reach thousands of commuters by catching their attention and inspiring them to take action. We have numerous advertising options available, including both static and digital billboards. Veale has been in the advertising business since the 1980s, making us one of the industry’s leading experts. We have lots of experience with a wide variety of businesses, including small, local businesses. We are proud to have become the top outdoor advertising company in the Vallejo area. With our help, your message can reach local, regional, and/or national audiences. As opposed to radio or television advertising, your message will reach a much broader scope because your viewers aren’t limited to your subscribers. Anyone who passes by will see that you have one of the best billboards on I 80. 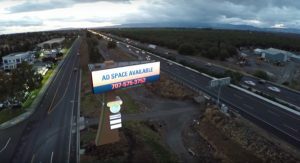 New technology makes it easier for you to secure a state of the art digital billboard that offers many advantages over traditional static billboards. Since you can update your message as often as you need, you have a more dynamic advertising space. If your business has a weekly sale, a digital billboard can be regularly updated to reflect your great values! The experts at Veale Outdoor Advertising will work directly with you to ensure that we understand your business’ specific message and needs. When you are ready to take your business to a new level, contact the top outdoor advertising company in Vallejo. We look forward to helping you secure your future growth.